The ever popular Brillantmont Summer Course returns on July 5th, welcoming students from 30 different countries. Parents of returning students – of whom there’ll be many! – can expect the same winning mix of classroom language studies in French or English combined with sports, evening activities and weekend excursions. Parents new to our summer school 2014 will have many questions in the lead up to the course. With this in mind, here are some common questions for parents thinking of enrolling their children, or for those who have already done so. Q: How long does the programme run for? Q: Does the programme repeat itself? A: No. Students arrive and leave on Saturdays and stay for between two and six weeks. The content of the programme changes so that if students stay for six weeks, they will not be repeating the same things they have already learnt. 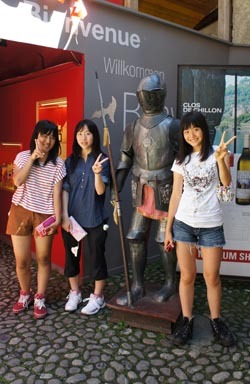 The excursions and activities also change to give as much variety as possible. Q: What summer activities are there for our children? When not in morning language classes, our students spend their weekday afternoons playing a variety of different sports. There are also opportunities for water sports on Lake Geneva, evening activities and weekend excursions to nearby cities and sites of historical and cultural interest, such as Château de Chillon, the Maison Cailler chocolate museum and factory, and the Vallorbe Caves. Q : How do I know which language class my child will go into? A : Students will take a placement test when they arrive, to check their levels in English or French. We have classes in both languages and at all levels. Q : What about people who need to eat special food ? A : If a student has an allergy or has a special dietary requirement, for either medical or religious reasons, the school needs to be informed before his/her arrival. Special meals will be provided in such cases. Q : How much money will our children need to bring ? A : Everything is included in the summer course fees but students should have a small amount of pocket money, so they can buy postcards, drinks, small gifts. Pocket money is handed over to the school on arrival and kept in the school safe, and can be collected at break every day. Registration for the Brillantmont Summer language programme 2014 is now open, with places going quickly! Click here to visit our Summer Course page and request our information pack, which includes further details on how to enrol with all the appropriate forms. Why do children excel at Summer Courses in Lausanne?